A slow relaxing start to the day brought us to a tour of English Camp (i.e. Pig War) True to British style, the camp was an oasis of civilization on the outskirts of the western frontier. After a lunch and nap back at the cabin, we stopped at Lime Kiln Park, a park that is famous for its whale sightings. Our intention was to walk the loop and move on to the next destination. 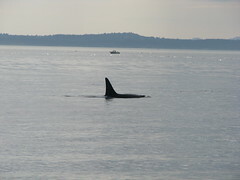 However, shortly after we got there, a super pod of Orcas came right passed us. What a spectacular sight as no less than 50 Orca paraded in front of us, some less than 20 yards away! We later discovered how fortunate we were as records show that there are about 60 sightings a year from this spot. The rest of the day paled in comparison to our whale watching, but we took a quick tour of American Camp and Cattle Point before heading back to the cabin for seafood fettuccini.